As requested by you I am forwarding my comments on some aspects of the report of CCIA for your consideration. 2. I agree with the CCIA statement that “the people and communities are struggling to attain a sustained peace and reconciliation”. But who is disrupting the path to peace and reconciliation? The available evidence points the finger to to the Tamil diaspora which has adopted a policy to confront the government by going back to the Vadukoddai Resolution of 1976 which was an open declaration of war to establish Eelam. The Tamil parties, particularly the TNA, are focused on politics while the GOSL is focused on developmental and poverty-alleviation programs as the route to peace and reconciliation. The speech of the leader of TNA, R. Sampanthan, in Batticoloa is view by political analysts as a decision to go back to the Vadukoddai Resolution — the mother of all north-south issues. They are aware that economic upliftment will defuse the fire of their divisive politics and hence their intransigent attitude to go back to belligerent politics threatening even war. This does not augur well for peace or reconciliation. Tamil political parties are refusing to join the all party Parliamentary Committee to work out a common, consensual formula. Tamil diaspora and Tamil political parties are exploiting the misery of the Tamil IDPs to destabilize Sri Lanka by stoking the fires of war again. Genuine attempts are made at grassroot level by many well-meaning organisations and individuals to re-build their lives and bring reconciliation. 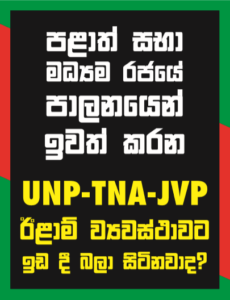 The Tamil diaspora which collected $300 million per annum to buy arms for the LTTE, according Jane’s Weekly, is collecting money but funds are not received by the needy in the north. Why? and what happens to the money? 3. CCIA report: “Several hundred war widows and orphaned children struggle to attain the necessary day-to-day support.” I agree. This is a common problem to most Sri Lankans in all parts of the island just not in the north. Incidentally, the Churches were very silent when the Tamil children were plucked from their parents bosom and sent as fodder to the front line by the LTTE. In one notorious instance, the Catholic priests rang the LTTE and told them that there were young girls handed to them for protection by the Tamils parents. The LTTE came in the night and took them away. CCIA report should have looked into the role of the Churches in LTTE-controlled areas. For instance, why did Bishop Ryappah allow the image of Holy Mary to be hijacked by Catholic priests and run into LTTE controlled depriving the majority of the Catholics from venerating the holy image? 4. “Continued militarization remains a problem as large portions of the north are still occupied by military forces and most areas have been declared “high security zones” under the control of armed soldiers. This situation prevents the local people from access to and use of their ancestral land.” World War II ended in 1945 but American GIs are still stationed in Germany and Okinawa much against the protest of the people, especially Japanese whose women have have been raped. Besides, America is not facing the threats of the LTTE agents abroad regrouping and collecting money to launch another war. GOSL is aware of the impeding threats from the remnants of the LTTE. What is more the GOSL has released 11,000 LTTE cadres. GOSL is not quite sure how they would react after they have been released. The military is there as a protective force. The military in the north is not acting as a war time army. It is engaged in many civilian projects cutting the costs down to the nation. Finally, if the military can be stationed in the south why is it wrong to have it in the north? Investigations by other groups reveal that opinion is divided in the north about the presence of the army. Tamils parties engaged in competitive politics have been a threat to the lives of individuals and they do not want the army to be removed as that is the force that guarantees their security. We note that you have spoken to the wing that supports the withdrawal of forces. We can quote from sources that support the other point of view. Besides, the presence of the Army is not only for the north but for the whole nation. Any disruption in the north affects the whole of the nation. Reconciliation begins with stability. And the presence of the Army is essential in the foreseeable for peace, security and reconciliation. 5 CCIA: “The delegation met with war-affected people who had lost limbs to landmines as well as women who witnessed the death of husbands during the last days of the war. ” It is sad to note that the delegation did not meet the non-Tamils who were victims of the war. The focus of the report is primarily on the north. Why? CCIA is like a curate’s egg: good in parts. It, however, lacks a holistic approach. For instance, compared to the de-Nazification program at the end of WWII GOSL has implemented a more humane program which has yielded positive results. Unlike the TGTE, GTF and other anti- Sri Lankan lobbies individual Tamils returning from Sri Lankan report positively on the new developments though they agree a lot more has to be done. But the provocative role of the Tamil disapora and the INGOs and NGO allied to them is driving the GOSL to be defensive and take military precautions. If the Tamil diaspora and its allies in INGOs and NGOs adopt a more positive and understanding stance it would automatically reduce the fears of the GOSL and the nation and help to reduce tensions. As the American Ambassadress, Butenis, said the demands of the Tamil diaspora and the people on the ground are totally different. The former is focused on politics and the latter is focused on economics. Every encouragement should be given to economic development as that is the most urgent need. Politics can come later. attempting to rebuild the country for the benefit of all its citizens. As post war Sri Lanka experiences a high level of militarization, the northern provinces of the country continue to face serious humanitarian and human rights problems. Three years after the end of a protracted conflict and war that ravaged the country for quarter of a century, the people and communities are struggling to attain a sustained peace and reconciliation. This warrants intensified efforts in building peace and reconciliation among people and communities, observed an international ecumenical solidarity team that visited the war-devastated northern regions of Sri Lanka from 28 July to 1 August. The solidarity visit was organized by the Commission of the Churches on International Affairs (CCIA) of the World Council of Churches in collaboration with the Christian Conference of Asia (CCA). (See: http://cca.org.hk/ ) The visit took place as part of the CCIA activities in response to accompanying churches in the situation of conflict. (See: http://www.oikoumene.org/en/programmes/public-witness-addressing-power-affirming-peace/justice-and-accountability/churches-in-situations-of-conflict.html )The team visited the northern provinces including Kilinochi, Puthukudiyiruppu and Mullaitivu where the war finally ended three years ago. The team met with church leaders, civil society actors and war-affected people. Sri Lanka suffered from decades-long ethnic conflicts and civil war between its Tamil and Sinhalese populations before the conflict officially ended in 2009. Since that time, all communities in the country strive to return to a sense of normalcy. However, challenges remain as large populations of severely traumatized people require psychosocial support in order to become reintegrated into the community. Several hundred war widows and orphaned children struggle to attain the necessary day-to-day support. Continued militarization remains a problem as large portions of the north are still occupied by military forces and most areas have been declared “high security zones” under the control of armed soldiers. This situation prevents the local people from access to and use of their ancestral land. The delegation learnt from social workers and civil society organizations representatives working in the region that land grabbing by the military and denial of access to land for residential and community use is a pressing problem in both rural and urban areas in the northern provinces. Quoting local witnesses interviewed in Mullaitivu, Dr Emily Welty, a CCIA member from the Presbyterian Church (USA), observes, “Although there are development initiatives taking places in many areas, the war-affected local communities feel that it is too limited and it needs greater participation by local communities in developing sustained peace and reconciliation rather than a military-controlled approach in development”. Welty, a professor of Peace Studies at the Pace University in New York, said, “any post war reconciliation can be achieved only through active participation of affected communities in peace and reconciliation, but the people in post war northern Sri Lanka need to feel and experience trust and confidence as they continue to live in a vulnerable situation”. During a discussion with the members of the executive committee of the National Christian Council in Sri Lanka, Johnny Simanjunta, a member of the ecumenical solidarity team representing the CCA, who is also a member of the Human Rights Commission of Indonesia, shared his experiences from the visit. “The rampant militarization process taking places in the northern provinces and the presence of armed soldiers in each and every corner even in remote villages will hamper the process of normalization of the unity and reconciliation, as the militarization process is threatening human security in northern Sri Lanka,” he added. The delegation met with war-affected people who had lost limbs to landmines as well as women who witnessed the death of husbands during the last days of the war. “Churches in Sri Lanka are in a unique position to engage positively in post war reconciliation involving members from both the Sinhalese and Tamil communities. The ongoing commitment of Sri Lankan churches to Sri Lanka’s peace and reconciliation mission and their engagement in humanitarian relief and reconstruction efforts, and the rehabilitation of war victims through interfaith collaboration, are unique examples of Christian witness which should be appreciated, recognized and supported by the international ecumenical community,” said Dr Mathews George Chunakara, director of the CCIA. Ranjith Soysa Spokesperson- Society for Peace, Unity and Human Rights for Sri Lanka Vic-Australia.